Art Deco style sideboard. Bronze Sideboard II. Beautiful four door sideboard with soft closing system for doors and drawers and one shelf in each side compartment. Available in a choice of finishes. Grand. Art Deco style of the 20s and 30s based on skyscrapers. Understated glamour. Figured Sycamore stained dark grey in high gloss finish, bronze trimming detail all around the top and base. Bronze inlay on the sides. 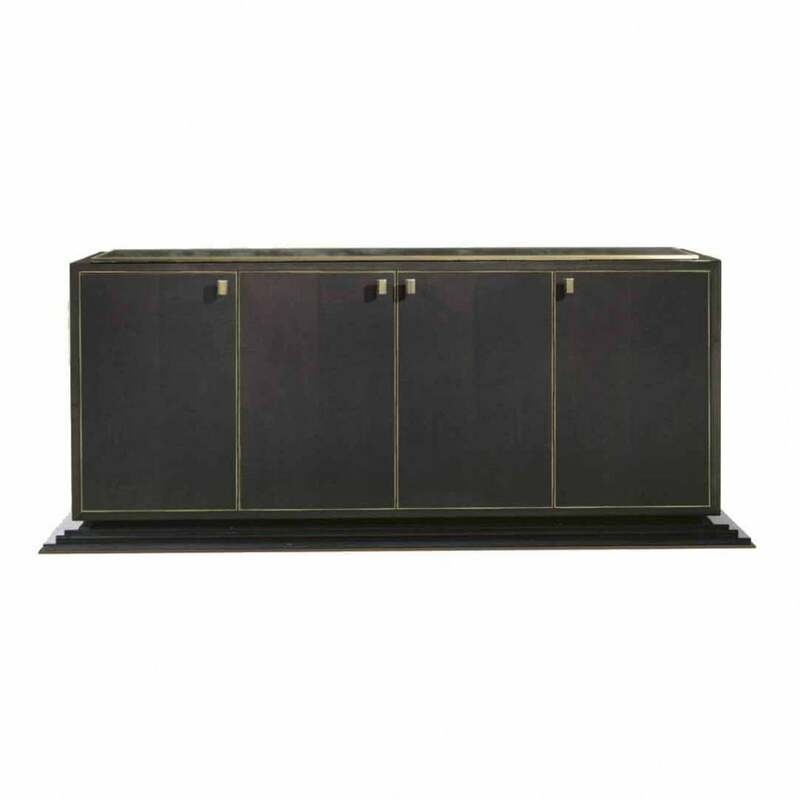 Top covered in dark grey parchment in high gloss finish, n. 4 doors with bronze detail all around the doors, soft closing system for doors and drawers, chest of drawers with bronze handles inside the central compartment and n. 1 shelf in each side compartment. Plenty of room for storage. Stunning addition to a dining room or entertaining area. Keep drinkware and tableware in here. Serviettes. best cutlery. Mirror above such as Christian Guy sunburst style mirrors. Priced for Natural Black American Walnut or Figured Sycamore stained dark grey in high gloss finish, bronze trimming detail all around the top and base. Bronze inlay on the sides. Top covered in dark grey parchment in high gloss finish, four doors with bronze detail all around the doors, soft closing system for doors and drawers, chest of drawers with bronze handles inside the central compartment and one shelf in each side compartment.